The following were researched: the El Nino Southern Oscillation (ENSO), Pacific North-American Index (PNA), East-Pacific Oscillation (EPO), Arctic Oscillation (AO), North Atlantic Oscillation (NAO), Pacific Decadal Oscillation (PDO), Atlantic Multi-decadal Oscillation (AMO), analogs, climatic trends with respect to temperature and precipitation, recent pattern progression/repetition, autumn precipitation/temperature departures, sea surface temperature anomalies in both the Atlantic and Pacific, cryospheric evolution (trends, anomalies), and solar trends. If one examines PDO values in the October prior to the winter, one will find a strong positive correlation w/ the October and DJFM PDO modalities. 15/18 years, or 83% featured a positive correlation between October and the ensuing winter, DJFM. 1972-73 was a raging strong el nino, so that particular year shouldn’t be applied here. Both 1977 and 2004 had a positive DJFM PDO, preceded by negative values in October. This is also inconsistent with the PDO trends of 2009 as SST’s have been warming the past several weeks along the Western US coast and in the Gulf of Alaska; the region south of the Aleutians has continued to feature below normal SST’s. September 2009 finished with a +PDO and October 2009 will do the same, thus I believe the upcoming winter DJFM has a > 95% probability of seeing a positive PDO. 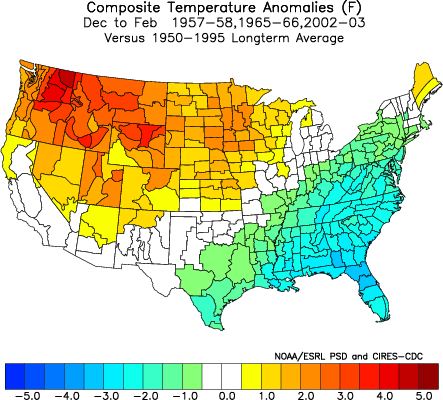 10/10, or 100% of years with a +PDO in October featured a +PNA in the ensuing winter as well. Thus, I strongly believe 2009-10 DJFM will feature both a +PDO and +PNA overall. Since the PNA and the EPO tend to be inversely correlated, I also anticipate a –EPO signal for large parts of the winter with the presence of a West Canadian/Alaskan block. ASO: Will likely finish at +0.9c. Most weeks in this period have featured +0.7 to +0.9c readings in region 3.4; however, the last week to 10 days have seen a fairly sharp increase in positive anomalies east of the dateline, translating to +1.1 to +1.3c values in the latest weekly ENSO reports. The climate regime is completely different from 1991 right now so that’s a terrible analog in my opinion, when considering indices like the PDO, AMO, and especially the GLAAM. The closest analog out of the ones I listed to 2009 would be 1957, which peaked at low-end strong, +1.5 to +1.7c. 1957 is also one of the best analogs out of those years when it comes to GLAAM values. The GLAAM is essentially a measure of the relative speed of the Earth; negative values tend to correlate with stronger easterly trades in the Pacific and thus a tendency for more La Nina events, whereas positive values indicate an overall slowing of this speed and consequently weaker easterlies and a regime more favorable for the development of El Nino’s. We’ve seen El Nino events with –GLAAM regimes, 1957-58 being one of those events. 1965-66 is also a good analog for the GLAAM; however, 1965 featured a –PDO October and DJFM, which I don’t believe will happen this. Nonetheless, no analog is perfect, and they are utilized to help draw important conclusions in piecing together the whole puzzle. Below is a chart depicting the total GLAAM anomalies since the mid 1950s. Note the negative consistency during the 1950s-1960s, similar to the regime we’re in right now. This is also a reason why I anticipate this particular El Nino event to be colder on a national scale than the “climatology” typical for moderate ninos. There’s an important distinction between Nino’s that occur within a warm regime overall (i.e., 1980s, +PDO) and Nino’s that follow immediately after consecutive years of cold La Nina/-GLAAM events. The latter builds the cold reservoir in the arctic such that when an El Nino arrives, that new regime forced upon the old one is likely to produce a very interesting pattern to say the least. Now here are some various dynamical/statistical model ENSO forecasts for the winter. The average value for region 3.4 is +1.2c, or low end moderate peak. The ECMWF forecast is similar with a region 3.4 peak early winter, +1.2 to +1.3c. Therefore, based on the factors mentioned already regarding historical ONI values and GLAAM trends, in conjunction with latest model support, I’m confident in a low-end moderate ENSO peak for the winter; region 3.4 values +1.1c to +1.3c. However, weekly readings may continue to reach +1.3 to +1.5c in the coming weeks. October has proven to be a crucial month in terms of signs for the NAO modality in the ensuing winter, DJFM. There has been a strong tendency toward a reversal of the NAO state from Oct-winter (inverse correlation), which becomes even more impressive when narrowed down to weak ENSO years. For the purpose of this outlook, let’s examine the 18 el nino Octobers/winters since 1950. 15/18, or 83%, followed the rule of inverse NAO state. 1987-88, 1972-73, and 1968-69 did not. However, 1972-73 was a super-powered nino, which likely prevented any blocking from occurring, and 1987 peaked strong nino in the months preceding the meteorological winter. 1968-69 occurred near the decadal minimum of the AMO phase, when the Atlantic was very cold overall, which in my opinion aided the NAO from turning positive that winter. Thus, I see a very good correlation here, and with October 2009’s NAO modality being negative, the upcoming winter, DJFM, should be slightly positive overall (that does NOT mean it’ll be positive every month, in fact there will be plenty of –NAO periods). I don’t anticipate a raging +NAO considering the Pacific/north pacific signaling should be quite favorable. Therefore I envision plenty of volatility in the Atlantic as the good Pacific pattern coupled w/ -AO will mechanically induce a –NAO at times. If one notes the AO values during the 18 El Nino winters since 1950, there is an overwhelming signal for a –AO to dominate. 14/18, or 78%, featured a DJFM AO average in the negative territory. If we look at the winters which had a +AO; 1972-73 was a very strong el nino, and as I noted in the NAO explanation, the ENSO signal was likely so overpowering that sustained high latitude blocking could not exist. 1991-92 was another pretty strong el nino event – should not occur this year. Now 1994-95 and 2006-07 may be the two question mark years as they had a +AO dominate and were NOT of strong intensity. Viable answers to this question could be found in the Quasi-Biennial Oscillation (QBO) for those years. To put it short, the QBO is an oscillating wind field between easterly and westerly in the tropical stratosphere. The easterly phase tends to be more turbulent in nature and more likely to see downward propagation of stratospheric waves through the tropopause and into the troposphere, which can have effects on the AO state in the arctic, namely by promoting a positive height field, i.e. the development of a –AO. Both 1994-95 and 2006-07 had a +QBO during the preceding autumn months and through the winter, while 2009 currently has a moderate –QBO persisting. This could certainly aid enhancing the relative warmth of the stratosphere and thus a greater probability of a –AO winter regime. When coupled with El Nino tendencies posted above, I believe this is sufficient evidence to expect an AO averaging negative for DJFM. A) 31/59 (53%) years featured a warmer than normal winter in NYC. C) 28/59 (47%) years featured a colder than normal winter in NYC. When we shift our attention to El Nino years: 13/18, or 72% had colder than normal Octobers. Of these 13 cold El Nino Octobers, 8/13, or 62% were followed by colder than normal winters. The five years that turned warm: 1972-73, 1982-83, 1994-95, 1997-98, and 2006-07. Three of these five years were strong to very strong el nino events, which should not happen this year. 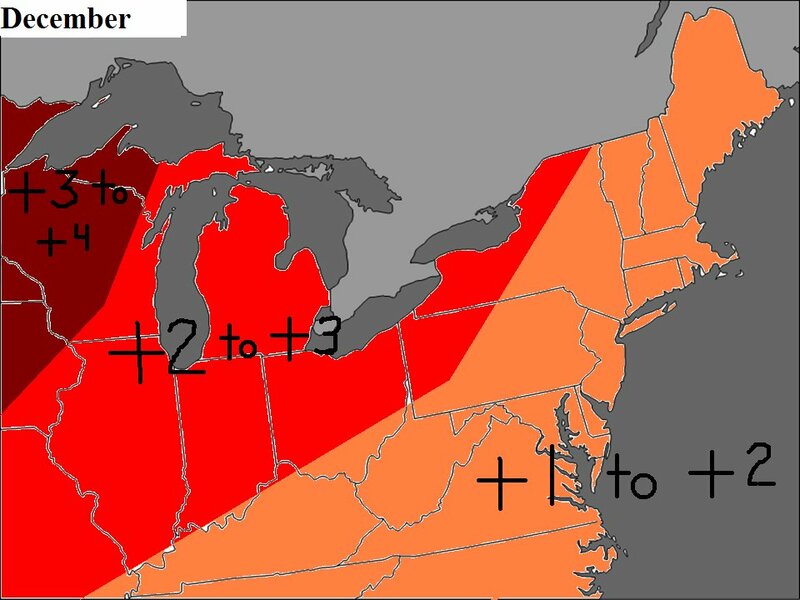 Autumn mean storm tracks / precipitation trends can also be clues to the ensuing winter. 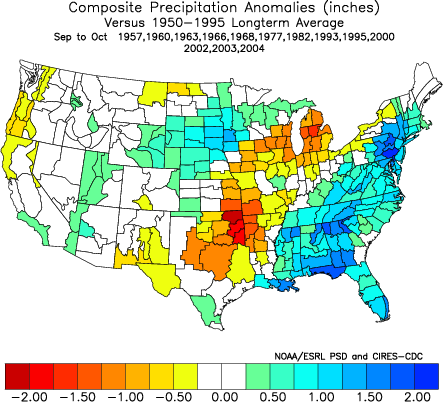 Below is a composite map of the Sep-Oct precipitation anomalies preceding snowy winters. Note the above normal swath up the east coast. Storm genesis regions this month have included a few coastal lows, as well as some Lakes-cutters. Based upon trends during autumn 2009 I expect the upcoming winter to feature its fair share of southern stream, classic nor’easters, as well as warm inland runners/Lakes-cutters. Analogs: Can be utilized for clues to the possible evolution of the current pattern; however, no year is ever identical. Nevertheless, the years which are the best three “all-encompassing” analogs in terms of the indices mentioned: 1957-58, 1965-66, 2002-03 (note especially that these three nino’s occurred immediately after cold ENSO year(s)). 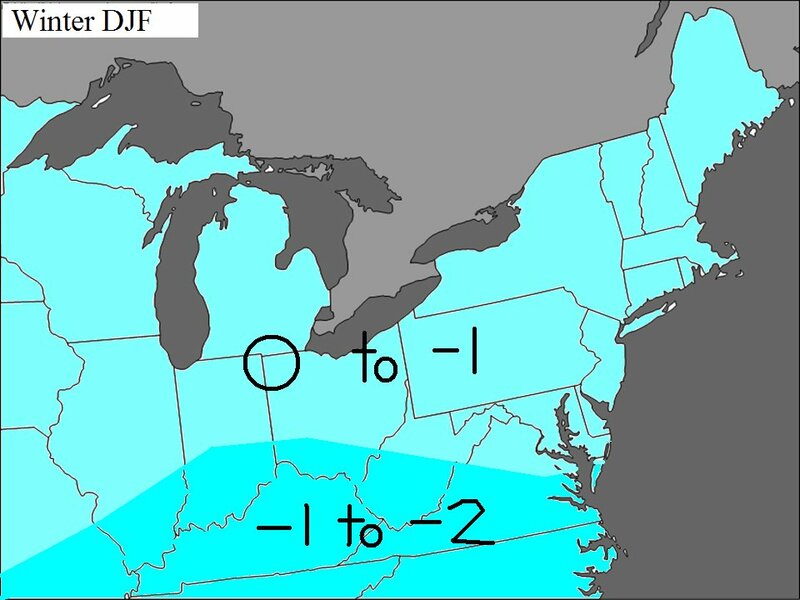 Below is a temperature composite of those three winters, DJF. The SSTA trends over the past several weeks have become more favorable overall, especially in the Pacific. Note the warmer anomalies that have developed in the northern Gulf of Alaska and along the Western US coast, with colder anomalies south of the Aleutians. This is a conducive orientation for the maintenance of a +PNA/-EPO pattern regime with troughiness near the Aleutian islands and a blocking ridge in Eastern Alaska/Western Canada, which is also a key in producing cross polar flow. The tropical Pacific is also looking good with the warmest SST’s relative to normal in regions 3.4/4 – a west based nino – supportive of the north pacific pattern I just described. First, a quick summation on my thoughts on index trends this winter: +PDO, +PNA, -EPO, +NAO, -AO, moderate El Nino. These are all favorable signals expect for the NAO state, which as long as it remains fairly close to neutral, should not be a significant hindrance to a colder than normal winter overall from the Plains eastward. Those of us in the East have suffered through recent winters of persistent SE-ridges; however, that should change in a pretty abrupt manner for this cold season if my ideas turn out correct. This will likely be the coldest winter on the East coast since 2003-04, which isn’t saying much since the past several winters were anything but cold. With that being said, I’m not anticipating a very cold winter for the Northeast. As per evidence from various indices, pattern trends, and analog years, I’m anticipating a progression from warmer than normal during the front 1/3 of winter to colder than normal once into January and February. Although February tends to be the coldest month relative to normal in moderate ninos, I would not be surprised to see January colder in the Northeast corridor (differing signals in cold magnitude for the two months). Thus, I’ve decided on similar temperature departures for the latter two months in NYC. Precipitation should be greater than normal throughout the winter with an active southern branch likely; thus I anticipate above normal snowfall from the interior Southeast into most of New England (northern new England should be closer to normal or possibly slightly below), although the degree of above normal snow is uncertain, I’ll go slightly conservative with generally 125% to 150% of normal for most areas from the Southeast into the Northeast. The Mid-west should finish the winter slightly below normal overall, contrary to moderate nino climatology, with eastern sections colder. January looks particularly cold in this region. Snowfall should be near to slightly below normal west of the Appalachians in the Ohio valley. Since NYC is the focus of my outlook, (the main city that will be graded) below is my expectation for them. Keep in mind that the forecasted departures do not necessarily mean the entire month will represent those anomalies (cold or warm). In fact, this winter should be rather volatile overall with a battling Pacific and Atlantic at times. Overall I’m very happy with this year. 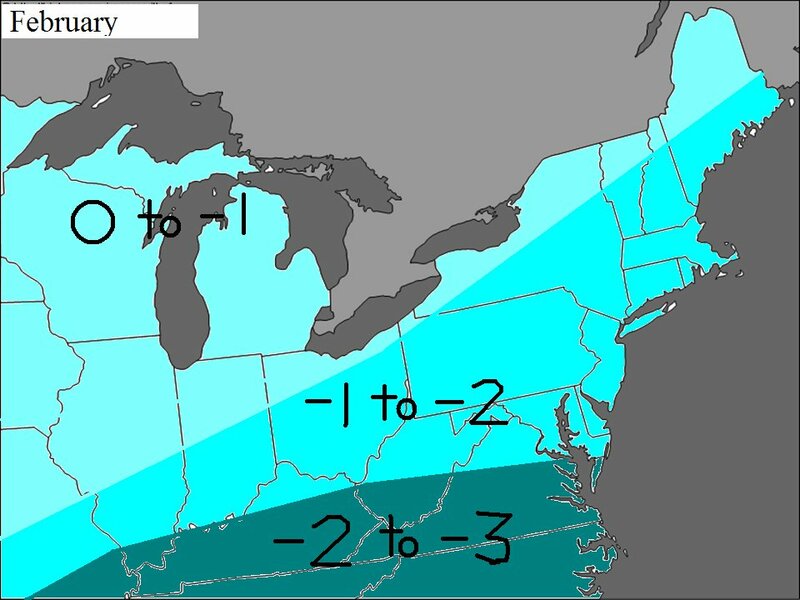 Probably my best winter outlook of the four I’ve done thus far, just ahead of 2007-08 and 2008-09’s B grade. 2006-07 was my worst. Also my analogs of 2002-03, 1965-66, 1957-58 worked out well in many ways (2 of those years were strong ninos). Pattern and index ideas were good, except the NAO was much more negative than I thought. My main regret was going too warm in December. Cold second half of the month turned around the departures. Also I could’ve gone a bit snowier, but I felt that forecasting much more than 35-42″ would have been foolish for a long range outlook.